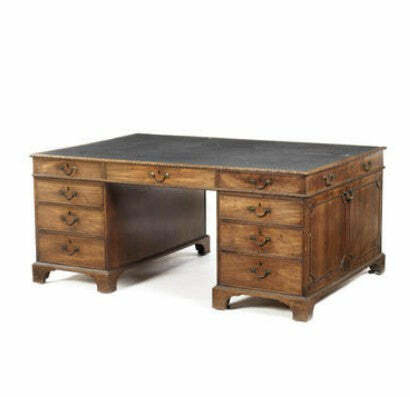 A George II mahogany desk drawn from Tresillick House, a vast neo-classical stately home in Cornwall, UK, auctioned for £58,850 ($90,132) at Bonhams yesterday (July 24). "In the manner of Thomas Chippendale", the handsome desk was purchased by former Trelissick House occupant and director of the Bank of England, Leonard Cunliffe, from Harrods in January 1914 for £500. The present sale price therefore represents a 4.3% increase pa. The auction also featured the £337,250 ($517,546) sale of a Chinese vase. Here at Paul Fraser Collectibles, we have a number of impressive items of antique furniture in stock.